Royalty Tours USA: Royalty goes to Cincinnati, Ohio for the MLB Ballpark Pass-port Stampede! 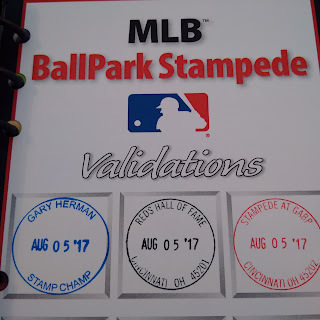 Royalty goes to Cincinnati, Ohio for the MLB Ballpark Pass-port Stampede! 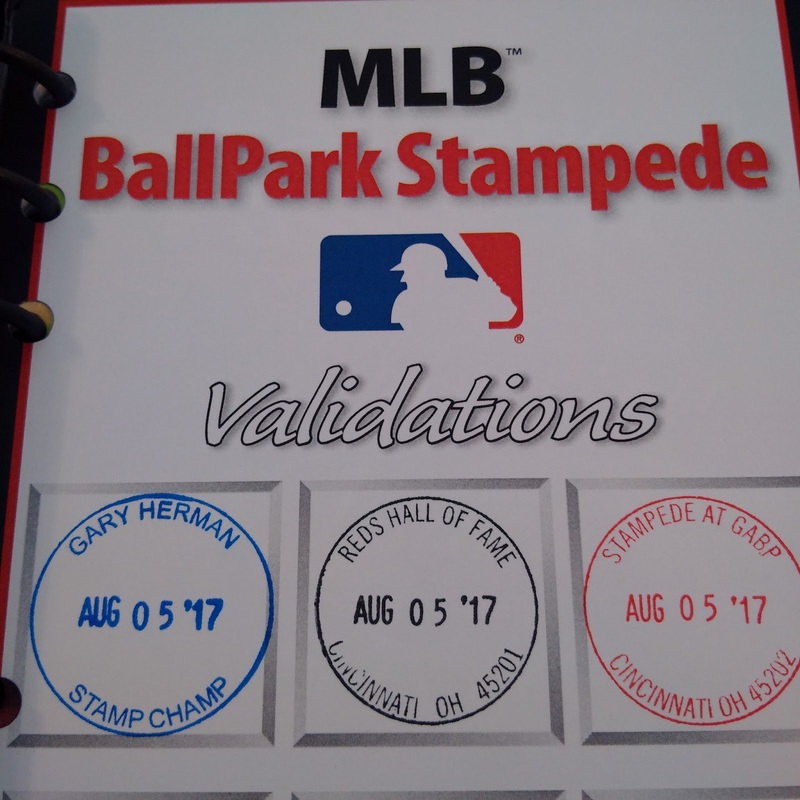 A few months before the baseball season started, the founder of MLB Ballpark Pass-Port Program, Tim Parks decided that he was going to have his annual group meet up known as the Stampede at Great American Ballpark on August 5th free of charge as long as you had a Pass-Port book of some kind. Last year he held his inaugural one in July. Unfortunately, I wasn't able to attend. This time I was determined to make every effort to do so. Despite the fact the Mets were hosting the Dodgers at Citi Field that weekend, I decided I'll hit the road instead. Without Tim's brilliant idea, this wonderful group of people wouldn't even exist. At the end of April, I went ahead & I made a reservation for a car rental. I also booked a few hotels in anticipation of the big weekend getaway. Three months later, the time finally arrived. After seeing a bunch of people from the group in Dayton, Ohio the night before I got to see three times as many in the Queen City of Cincinnati. I wound up parking the car I rented in downtown in a parking lot for the day around 11:30AM. I proceeded to walk over to Great American Ballpark, the home of the Cincinnati Reds where we had a day full of different events planned out for us. Before I could even check in, I was approached by a gentleman named Jamison Speidel, who lives in the Columbus, Ohio area in a suburb called Pickerington. Back in June, he messaged me on Facebook. 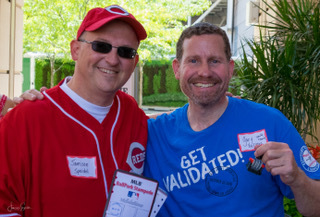 He asked me if I would be willing to back stamp his big Passport book from Yankee Stadium. He went there back on July 18, 2014 with his family. I told him it's not a problem. He wound up mailing me the page along with a picture of him & his family in their seats along with a copy of a ticket stub. Once I did the stamp for him, I sent him a picture of it. He was so grateful & appreciative. He told me he was going to talk to Tim Parks about getting me a gift for doing this for him. I didn't think nothing of it. I do things out of the goodness of my heart because that's truly who I am. When we finally met, I gave him back the page with the stamp. He gave me a little brown bag to show his deep appreciation for what I did for him. Before I opened it up, I thanked him. 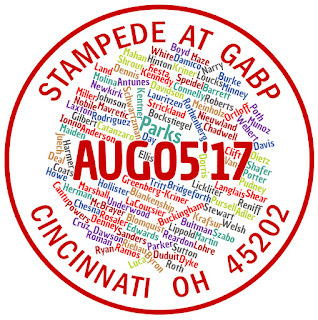 It wound up being a personalized stamp that said my name along the top of the circle with the date AUG 05 17 in the middle & my group nickname Stamp Champ along the bottom of the circle. He also got me a blue ink pad since he knows I like the Mets. 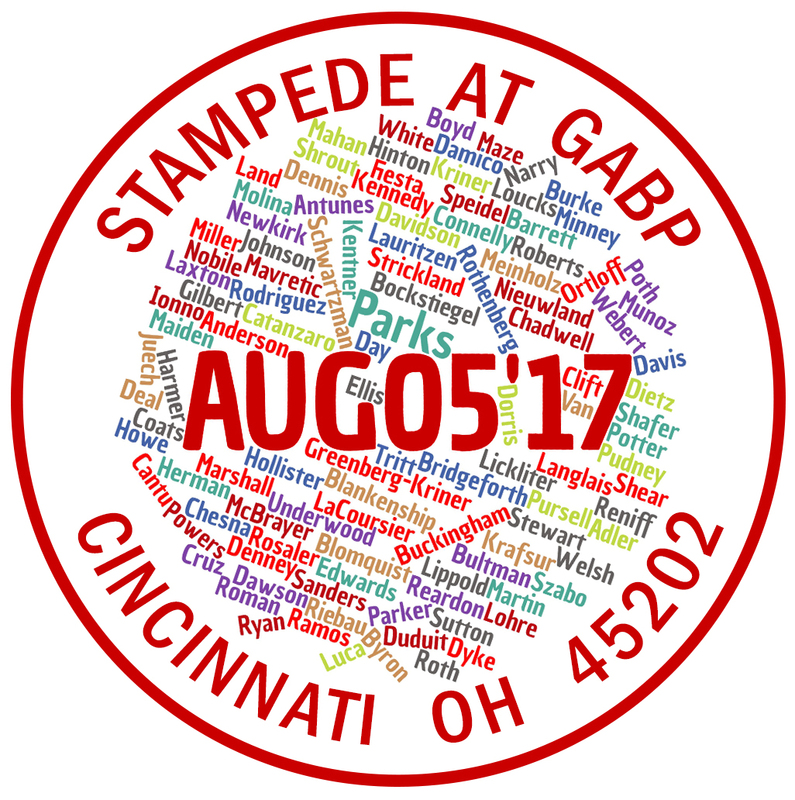 Ironically I was given that moniker by fellow Stampeder Matt Angeli when we met up at Yankee Stadium back on June 5, 2015. I was caught off guard. I'm just an every day person who works hard. When I master a task, I just keep repeating the process to make myself even better at it. I always remember the saying, practice makes perfect which I learned in elementary school way back in the day. After I finally got to check in, I got my name tag. I then had a line of people ask me to stamp their books with my new stamp. I gladly accommodated them all. When I got done, I proceeded to partake in the day's events. First up was the Cincinnati Reds Hall of Fame. 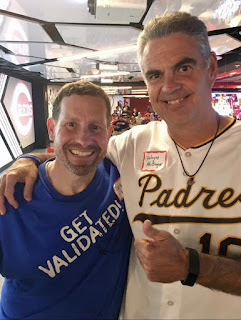 I got a special stamp from there then I walked around with my pal David Rothenberg aka Swag Man who decided to also pass up seeing the Mets at Citi Field that weekend. He left earlier in the week so he could finally get to some new ballparks he wanted to see. 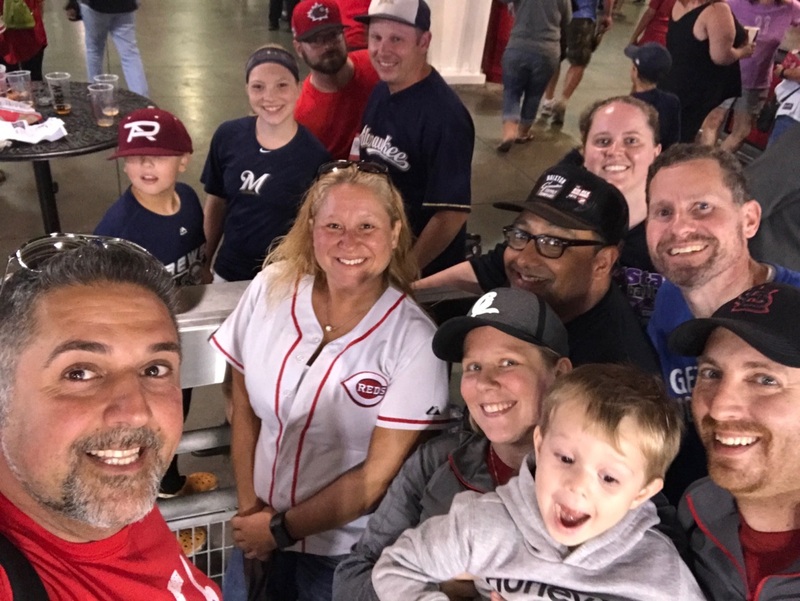 After we walked around & went down memory lane remembering the great history of the Reds franchise that goes all the way back to 1876, David & I as well as a number of others went outside to the batting cage to take some swings. I was all excited as I anxiously waited my turn to bat. When I finally stepped into the batter's box, I embarrassed myself sorry to say. After doing so, I said to myself, I better stick to stamping instead. 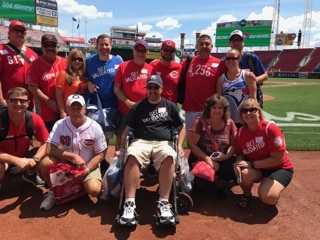 After we finished, we wound up joining the tour of Great American Ballpark which started without us. We were having too much fun in the batting cage. Once we got in with the group we got to go up to the press box which is the best view in most ballparks. That's where the media who cover the game sit. They do keep the windows open there & occasionally foul balls fly in we were told so they have to keep their eyes on their work as well as the ball. After we spent some time in there, we went downstairs where we got to see the Scout Club which is a lounge area for the media as well those people who can afford to enjoy a game in style. After passing through, we continued the tour by getting the opportunity to go on the playing field behind the home plate area. 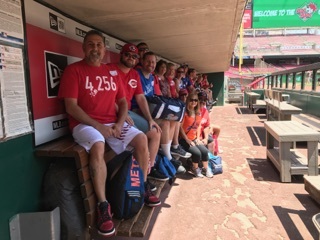 We also got to sit inside the visitor's dugout which is located on the third base side. It was a cool experience seeing what actually goes on behind the scenes. When we got done, we went back into the seating area on the first level & we took a group photo. 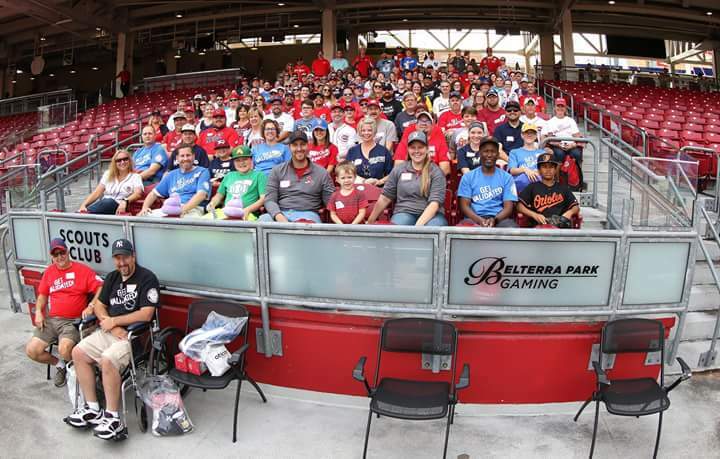 Shortly thereafter, we went back into the Scout Club again where we gathered for a question & answer session with former Reds pitchers Tom Browning & Bill Bray along with the Reds Chief Operating Officer Phil Castellini who handles the business operations for the Reds organization. Before the session started, I walked around the area. I went over to as many people in the group as I could so I could introduce myself. It was great to put a face to a name. Some people came with other family members which made it such a special occasion for those particular people. After all, this Pass-Port Program was designed to share memories from generation to generation. Once I finished acknowledging those I was fortunate to see, I sat down & I enjoyed the festivities. I really loved listening to Tom Browning talk about the day he decided to walk over to the roof tops across the street from Wrigley Field in his uniform to spend a few innings with the people who were sitting there that particular day. I also liked that he said he had fond memories of when the Reds came to Shea Stadium to play the Mets. As for Bill Bray, injuries cut his baseball career short but now he's in the process of going to Law school & he said he graduates in 13 months. That's quite an achievement. I wish him all the best in his future. 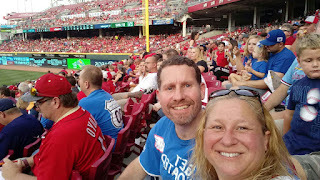 Once the question & answer session ended, we were given the option of watching the Reds take batting practice down by their dugout on the first base side or we could have left the ballpark to get something to eat outside then return. I decided to stay inside. By doing so, I was able to meet & greet more people I missed in the Scout Club. I also had people sign my Game Day Passport book which has room for autographs. After spending some time with these people, I went up to the concourse & I got my passport book stamped at guest services. I then walked down to the team store with some other people in the group. Since I was starving, I decided to go to the upper deck by section 428 where I was able to buy the All You Can Eat Food deal they had for $20. It consisted of five hot dogs along with unlimited pop, soda if you will, peanuts, popcorn & potato chips. I wound up eating three hot dogs, some peanuts, popcorn & I had a cup of pop. When I had enough for myself, I decided to share with others in the group. I proceeded to get two more hot dogs I was entitled to as well as peanuts, popcorn & countless bags of Lay's potato chips. After all, you can't just have one as they say. I managed to squeeze whatever I could into my bag & I proceeded to go back downstairs to section 111 row Y where my seat was located in short left field. Before I went to my seat, I saw fellow Stampeder Matt Luca who was in the handicapped area in his wheelchair with his Dad, David. I asked them if they were hungry. They said they were so I gave them the hot dogs I had along with some peanuts, popcorn & potato chips. 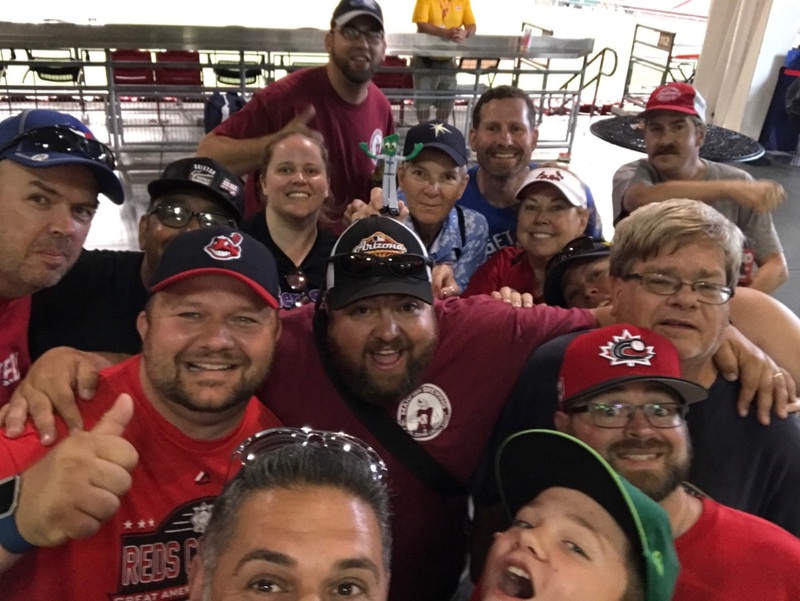 When I got down to my seat, I wound up sitting with fellow Stampeder Kim Clift who I got to meet & greet earlier during the ballpark tour. She was a real sweetheart & I really enjoyed her company. I got settled in & I got my score book ready for the game to start between the Reds & the St. Louis Cardinals. After I did that, I offered whoever was sitting around me some peanuts, popcorn or potato chips. It was hilarious as I started throwing bags of chips all over the place. It wound up being such a good time. As for the game we saw, the Reds took an early 1-0 lead in the bottom of the first inning when first baseman Joey Votto hit a solo home run. In the top of the third inning, the Cardinals went ahead when their rookie shortstop Paul DeJong hit a two run homer to give the Redbirds 2-1 lead. They tacked on a few more runs in the seventh inning as they went on to beat the Reds, 4-1. 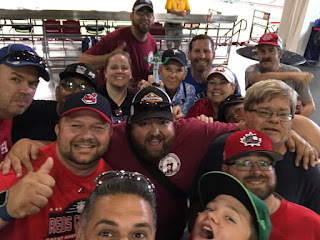 After the game, I said goodbye to those who were sitting around me. When I got up to the concourse I saw a number of others from the group hanging around. We wound up taking a few pictures together before we parted ways for the night.